Welcome to Mayfield Equine Travel in Westerham, Kent. We provide an easy, reliable and cost effective horse & pony transport service throughout Kent, Surrey, Sussex and the South East. Whether it's a show, a visit to the vet, picking up your new horse or moving yard, we can help. We operate a brand new coach-built horsebox, designed to the highest standards and capable of accommodating two large horses in comfort. We are fully insured and registered with DEFRA (37165). We also hold the Welfare in Animal Transport Certificate (WATO), which is now a requirement for horse transport services under UK and EU law. Having run a successful riding school and livery establishment for over 12 years, we have a great deal of experience in the equine world. If your horse or pony means as much to you as ours do to us, we know you will want to arrange transport with the confidence that they are in safe and professional hands. We pride ourselves on providing a tailored and reliable service and we operate a fair and transparent pricing policy. 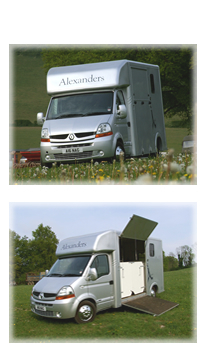 So, whatever your horse transport requirements, contact Paul on 07739 723 225 with the details.